Sew what's cooking with Joan! 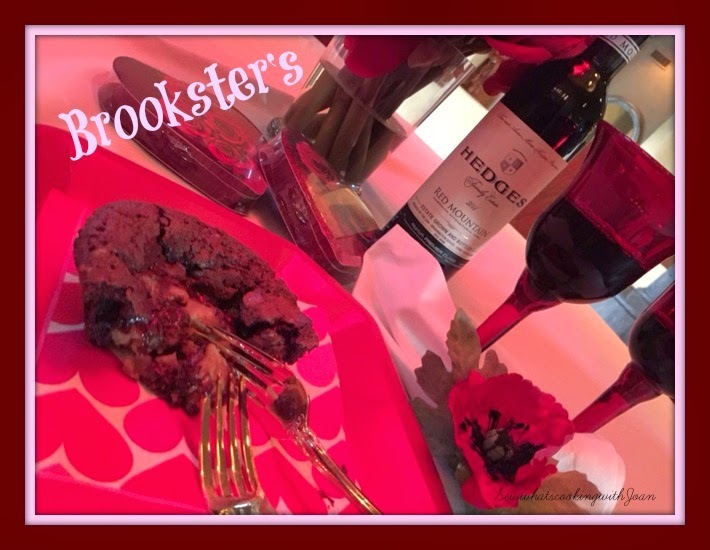 : Brookster's for your Valentine!! It's not quite a cookie, not quite a brownie, but with the best elements of both. They're called Brooksters! Are you still wondering what a Brookster is right now? It’s a mini Brookie..... which is a brownie cookie. 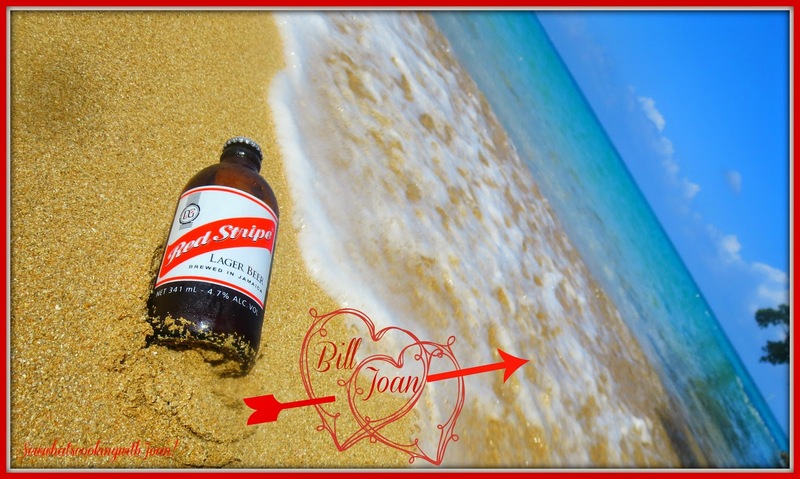 In other words… delicious! This ingenious idea is courtesy of two talented boys, Matt Lewis and Renato Poliafito. I was wandering around William-Sonoma a couple years ago and noticed a box of Brookster mix sitting on the shelf. I’m not one for purchasing boxed mixes; however, the idea definitely intrigued me. So, I bought it, and Sweet One (Amy) and I made them....omgosh so good!! Now I just had to recreate my own version. 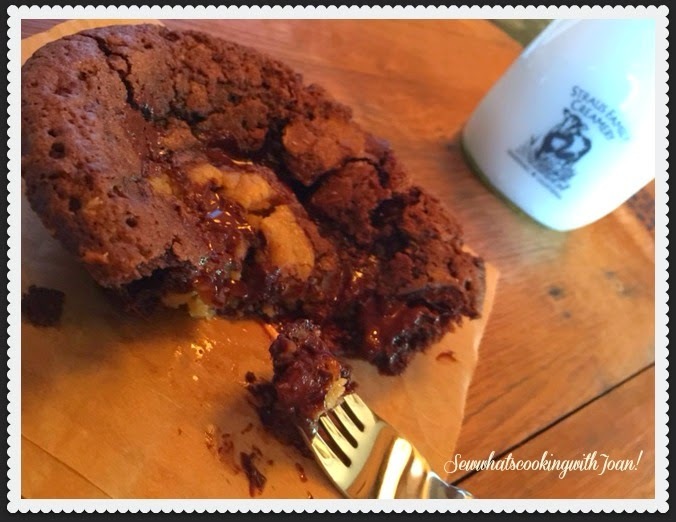 This Brookster recipe features decadent, golden brown extreme chocolate chip cookies baked atop dense, incredibly chocolatey Guirardelli brownie cups. 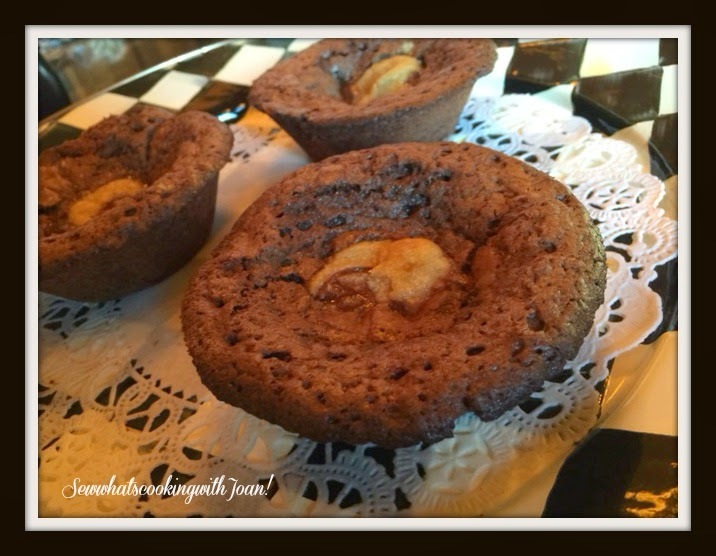 The marriage of these two well known confections results in a dessert that is just pure perfection!! Whisk together the flour, baking soda, and salt in a bowl; set aside. Combine the butter, both sugars, and vanilla in a large bowl; beat on medium high speed with a mixer. until smooth and fluffy, about 3 minutes. Add yolks two at a time. 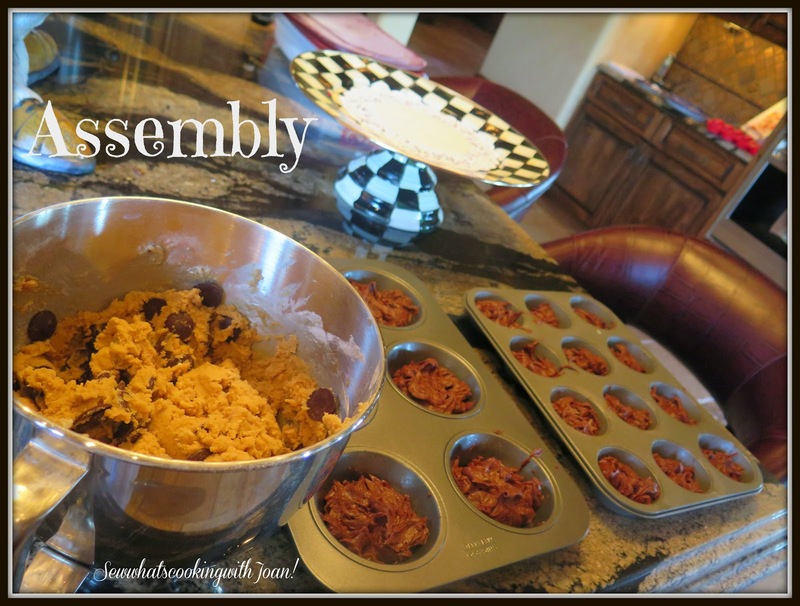 beating after each addition; add dry ingredients; beat on low speed until just combined. These are the most awesome brownies I've ever had the pleasure of eating. I got the recipe off the back of the can of GHIRARDELLI Sweet Ground Chocolate and Cocoa, years and years ago. 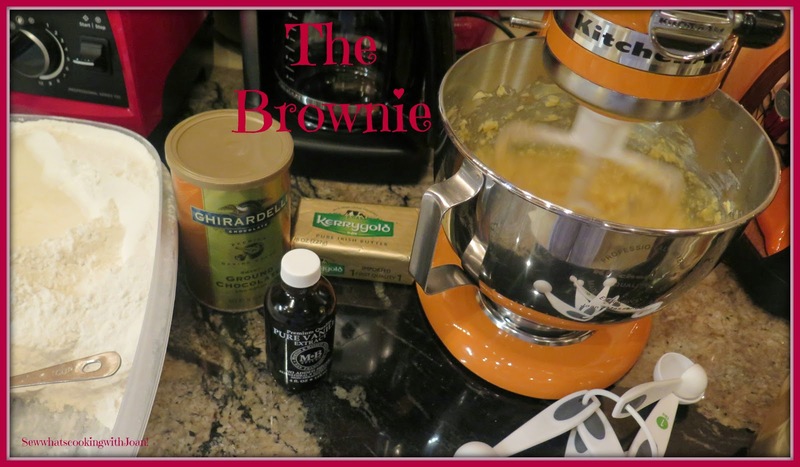 I have baked other brownie recipes, but I still think this one is the best! Guirardelli is now widely available at most grocery stores. So when I decided to put together a Brookie.....there was no question on what brownie I was going to use!! Using a mixer mix together the eggs, sugar and vanilla, add butter. Sift the Ghiradelli Ground Chocolate with flour, baking powder and salt. Spray each muffin well with Pam or lightly grease. 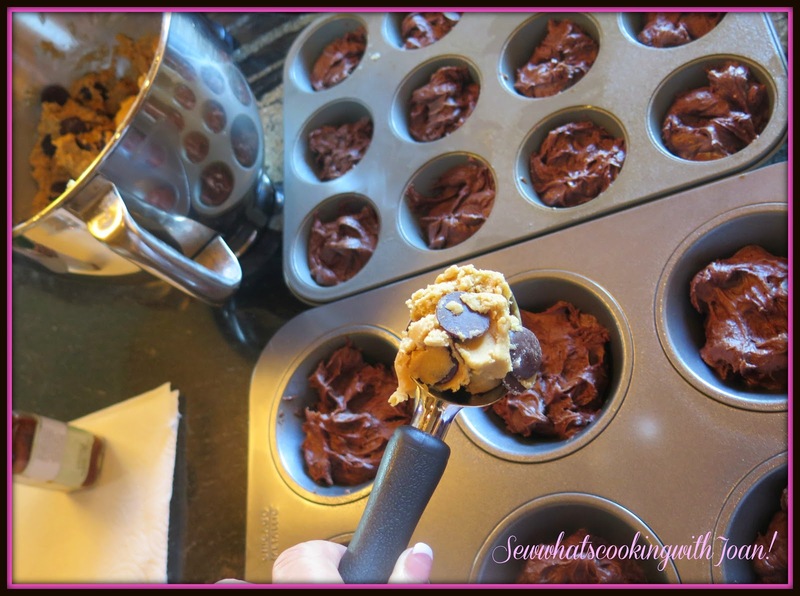 Fill each muffin well, with the brownie batter until it is just under halfway full. Place the baking sheet in the refrigerator and chill for 3 hours. 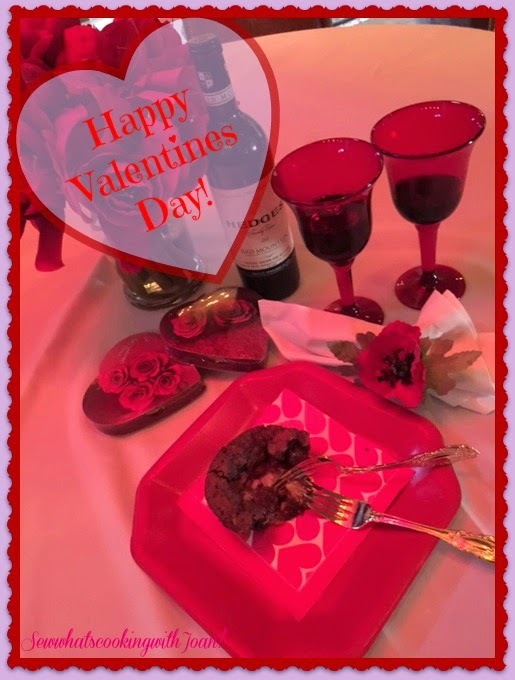 After the cookie dough and brownie batter have chilled for 3 hours, preheat the oven to 375 degrees F.
Using an ice cream scoop, scoop the dough into 1/4 cup - size balls and use your hands to shape the dough into perfect spheres. The disks should be slightly smaller than the tops of the muffin . Bake for 15-20 minutes, at mid oven and rotating the sheet halfway through the baking time. The Brookster's are done when the cookie part is golden brown. See baking notes below. Cool to room temperature or serve warm with ice cream. a glass of milk or hot tea. Yum! 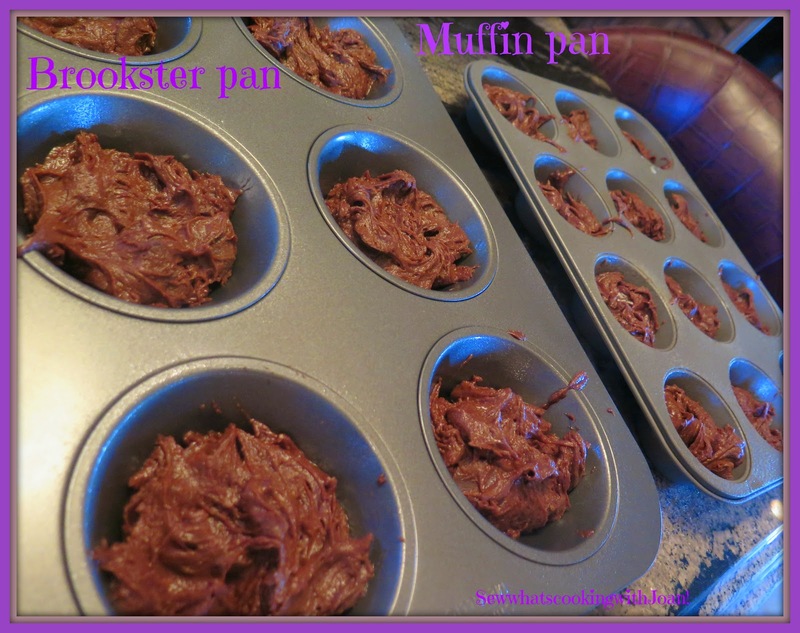 -Use only a light-colored metal muffin or cupcake pan. 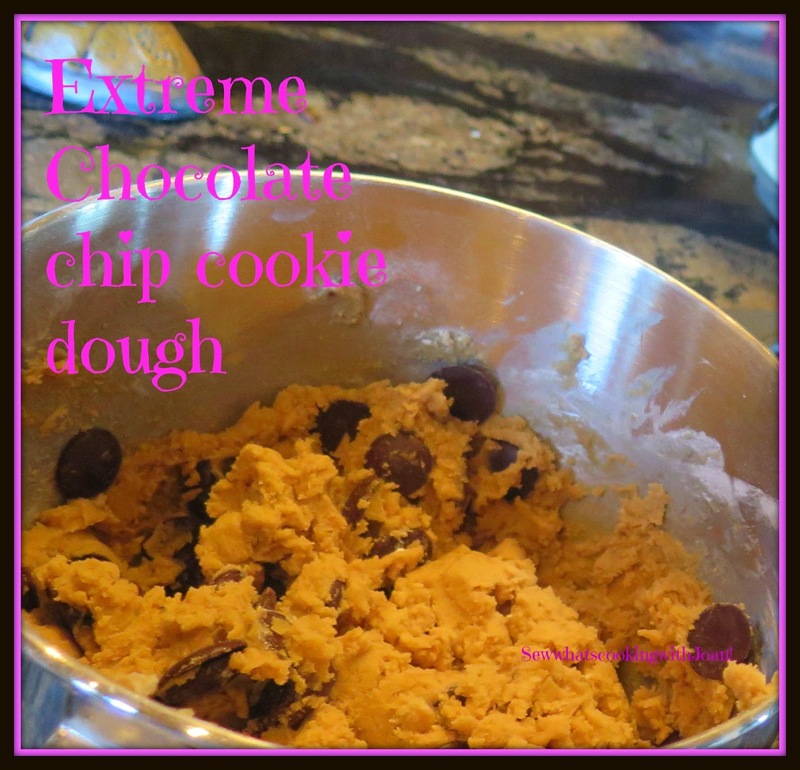 -Baking notes- One important note about the cooking times and temperatures for this recipe. I baked several batches of these Brooksters at different times and temperatures to test out various textures and consistencies. First, I baked the Brooksters at 375 F for about 16 minutes. This resulted in cooked outsides with a molten, fudge-like core. I baked the next batch at 350 F for about 20 minutes and the finished desserts were more evenly cooked through. I am a fan of undercooked brownies, so I definitely preferred the first batch. For this reason, my instructions above suggest cooking the Brooksters at 375 for 15 – 20 minutes. If you like your brownies completely cooked, then I would recommend going lower and slower 350 F for 17-20 minutes. It's up to you! Also- I sprinkled them with sea salt before baking. Yumminess over load!! The kiddo's will love these too! 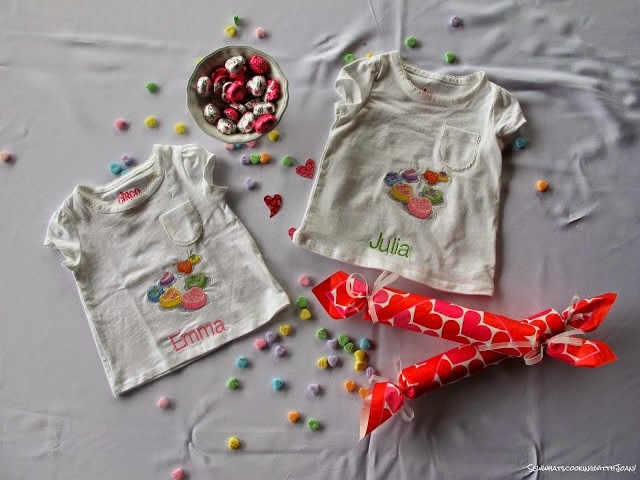 Also, if you want to make a easy surprise for the kiddo's, try making the Valentine Poppers!